Birth, growth, decline, death, purgatory, resurrection - or not. Two very similar stories; two very different outcomes. 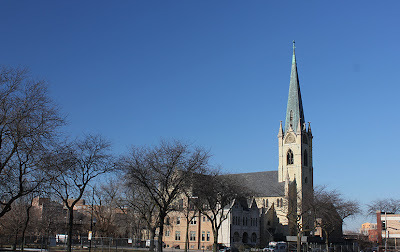 Even as the Chicago Archdiocese is about to set the bulldozers loose to destroy the even more historic 1880's St. James Church at 2942 South Wabash, the story of St. Mary of the Angels Church illustrates that with a more enlightened leadership, it doesn't have to be that way. 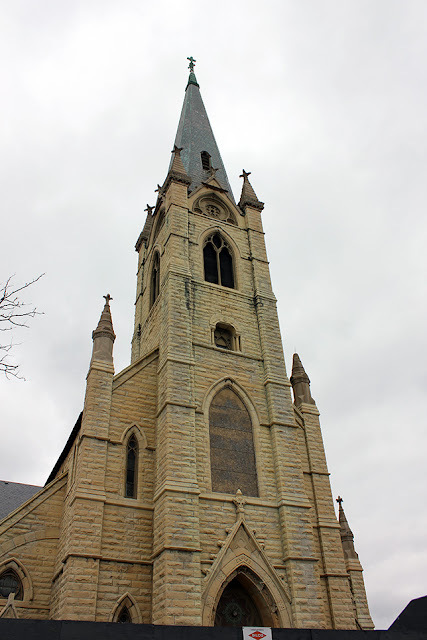 Friends of Historic St. James Church, the hardy band of parishioners and preservationists who mounted a spirited campaign to save St. James, appear to have lost out to Francis Cardinal George's determination to destroy the building, despite offers of a million dollars of in-kind services to save it. Like St. James, St. Mary of the Angels had a history worth saving. 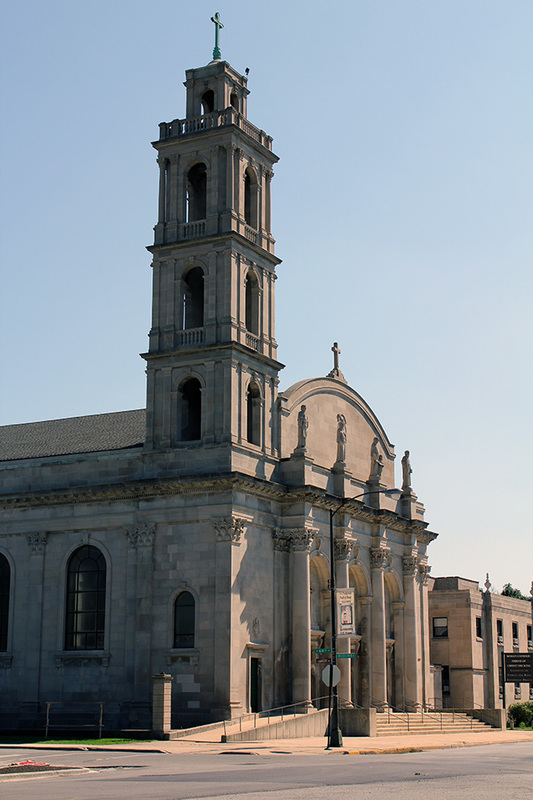 The parish was originally created to ease overcrowding at nearby St. Stanislaus Koska. Two city blocks - 86 lots - were acquired for $60,000. One was reserved for the church, the other subdivided for housing. 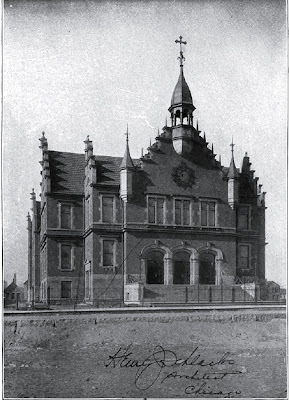 In 1899, a small combined church and school opened, designed by noted ecclesiastical architect Henry Schlacks. The congregation continued its rapid growth, and by 1909, St. Mary's first pastor, Rev. 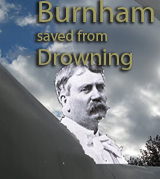 Francis Gordon began thinking about a larger church. Designed by Worthmann and Steinbach, it was modeled after St. Peter's in Rome, and its Baroque elegance sought to recall Poland's Golden Age, before it was wiped off the map as a nation, partitioned and occupied by three European powers. Work began on September 28, 1911, but the outbreak of World I and resulting materials shortages delayed construction. The resolve remained. 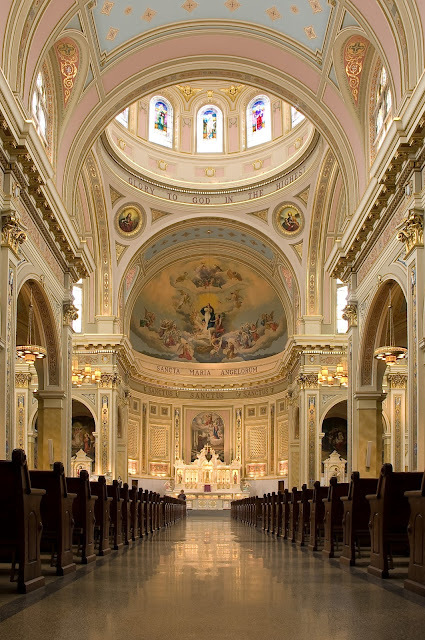 According to Denis Robert McNamara's book Heavenly City: The Architectural Tradition of Catholic Chicago, the new church was intended as a testament to “a belief in the Resurrection of Christ and the firm conviction that Poland would be restored.” And they were rewarded. By the time St. Mary of the Angels was finally dedicated in 1920, the victorious allies had again made Poland, for the first time in centuries, a sovereign nation. And then the construction of the Kennedy Expressway replayed the issue of partition by slicing up the community and destroying many parishioner' homes. When the superhighway opened in 1960, it became the conduit drawing many residents out of the city and away from the now mutilated fabric of their abandoned neighborhood. From a high of 1,600 families and 1,200 students, the parish declined, until it was closed in 1988, citing - sound familiar? 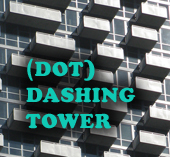 - dwindling membership and prohibitive repair costs as mandating the building's demolition. 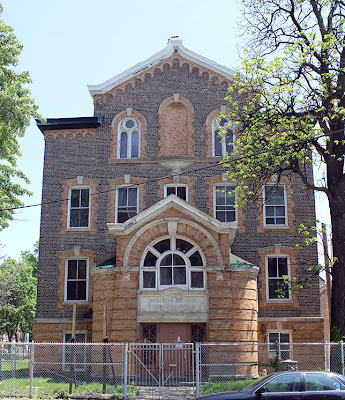 As has been the case at St. James, the announcement evoked an uproar, and an energetic campaign to reverse St. Mary of the Angels' death warrant. It must have been a gentler time. The Archdiocese's real estate operation was, always, indifferent, but it would be made to yield when those struggling to save the church found an ally in Joseph Cardinal Bernadin, who requested the Prelature of Opus Dei to assume responsibility for the historic building, which they did in 1991, beginning an extensive restoration, first with the dome, and then, in 1997, with the interior. 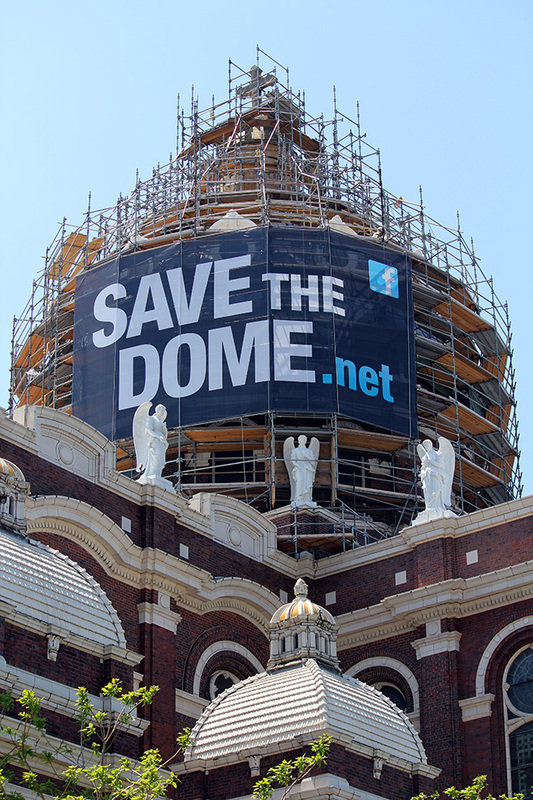 A Save the Dome campaign placed signs on that dome making its website url visible throughout the community. The cost of the repairs was estimated at $3.2 million, with $900,000 listed as raised. This has evolved into a Restore God's House Campaign. In addition to dome repair and renovating the south tower, it includes rebuilding the east parapet wall, which was dismantled for safety reasons in 1991, the elements all carefully put into storage. 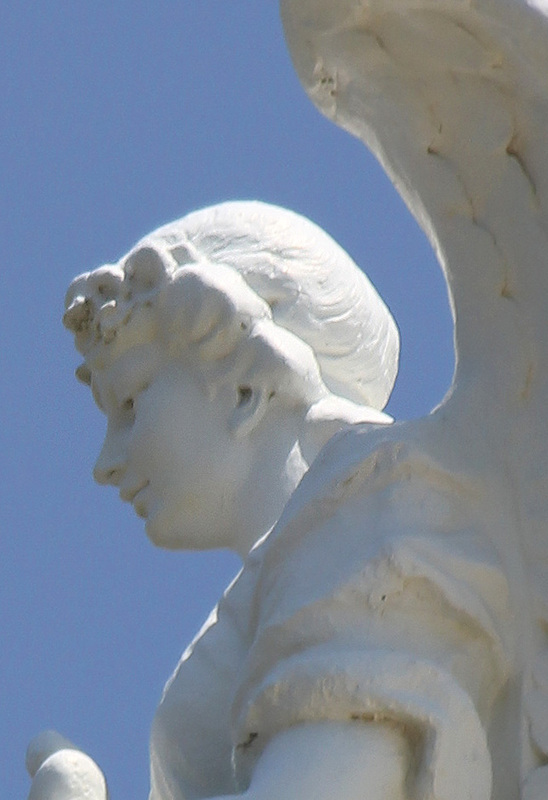 The church gets its name from the 26 angels placed along the exterior. My understanding is that these are not the originals, and the fact that they all seem to be identical gives the composition a certain Dolly-like quality that's not entirely reassuring. While certain economies were taken in the execution of the exterior, there's still the grand entryway on Hermitage . 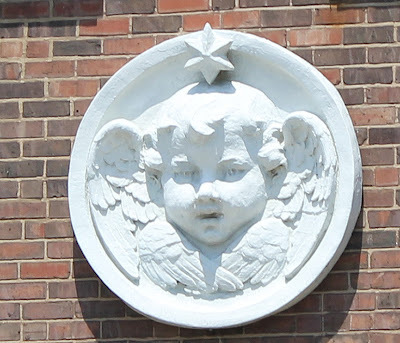 . .
and well as cherubs . 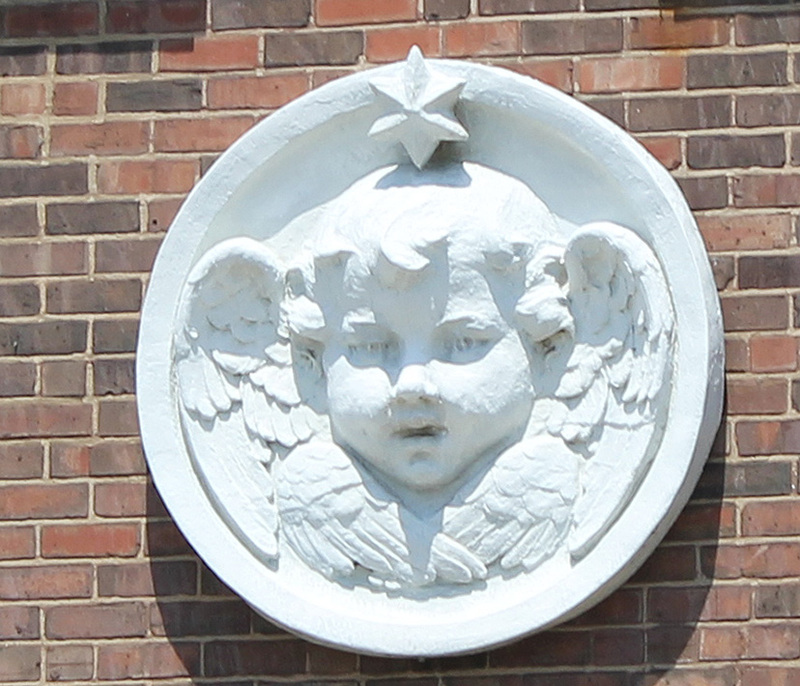 . .
and terra cotta ornament . . .
culminating in the papal coat-of-arms . . . The true glory of St. Mary of the Angels is its interior, including elaborate decoration added by artist John A. Mallin in the 1940's. 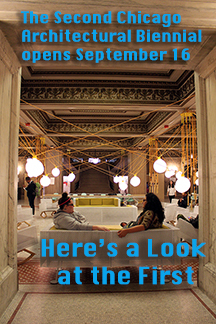 The sanctuary has just been documented in a stunning set of photographs by Chris Smith on the Out of Chicago website. And now I know the trick to getting those photographs with the great vantage points. Help change the light bulbs. Or at least that's what worked for Smith. What he intended as a pop-in shoot wound of being an all-day event. After helping out changing the bulbs in the chandeliers 30 feet above the floor, he got access to the balcony - and then everyone went out for Chinese buffet. 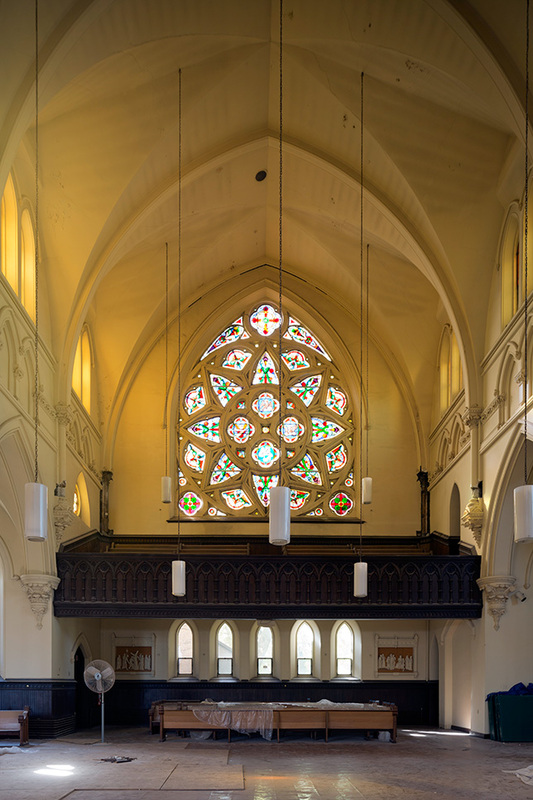 Check out Chris Smith's great photo portrait of the sanctuary here. 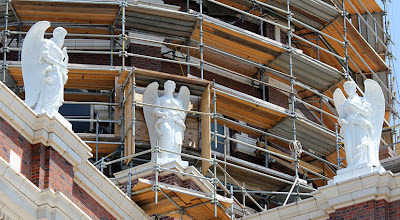 While nothing is ever certain in our increasingly secular world, St. Mary's of the Angels now seems to have a future. Attendance at services has grown. The nuns are long gone from the Sisters of the Resurrection convent constructed across from the church in 1905 . . .
. . . but they've now been replaced by the young professionals who continue to gentrify the Bucktown neighborhood - the building was recently been redeveloped as condos. You see the same thing happening on the Near South Side. I was impressed walking down to Second Presbyterian Church last week how the stretch of Michigan down to 19th street now seemed an almost continuous procession of loft conversions, new residential towers, bars, trendy restaurants and all the other accoutrement's of an economically revived neighborhood. Continuing north, just south of St. James, at 2942 South Wabash, you can see similar signs of change in the Motor Row district on Michigan that the city is intent on making a major music and arts district that will draw in both Chicago residents and all those conventioneers looking for something to do while lodged in one of the thousands of new hotel rooms McPier is constructing off of Cermak Road. The Archdiocese, of course, can't see it. 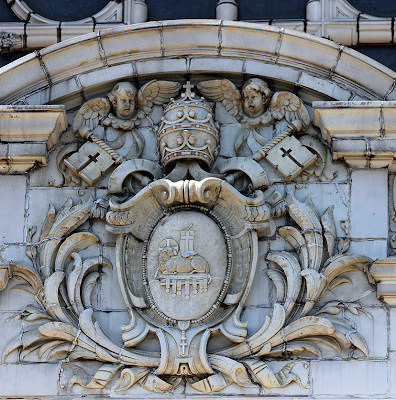 On Wednesday, lest anyone doubt its determination - and power - it punched a huge hole in the roof of St. James, and then, statement made, sent the wrecking crews home. 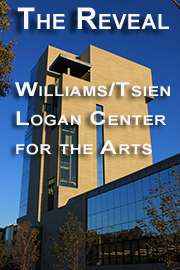 According to a report in the Trib by Ron Grossman, its spokesman declined to say when demolition would resume. 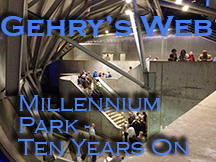 For the Chicago archdiocese, gazing into eternity - no problem. Looking a few decades down the road, not so much. If the Archdiocese had had their way, St. Gelasius and Holy Family would today be little more than parking lots and memories. 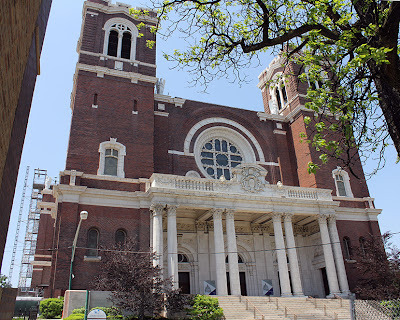 The announcement of their impending demolition, as at St. James, also evoked outrage and activism, but a more receptive Archdiocese listened, and agreed to alternatives that have made churches anchors of revival in their communities. 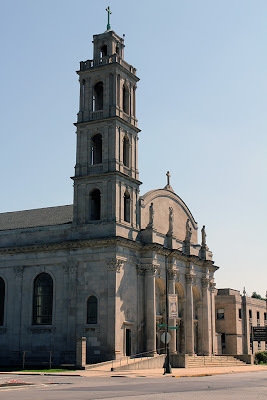 The Archdiocese would have you believe that the spirit of devotion generations of immigrants built with their sacrifices into the beautiful churches that expressed their faith vanishes from the building the moment it's deemed a real estate problem. Yet that spirit remains infused in the structure. 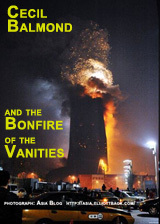 It has not vanished; it is deliberately destroyed and discarded as a matter of choice. 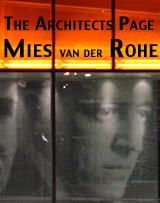 When a city destroys its architectural heritage, it consumes itself, and denatures its future. Will 130 years of history and faith be destroyed? Friends of Historic St. James rally to forestall wrecking ball. 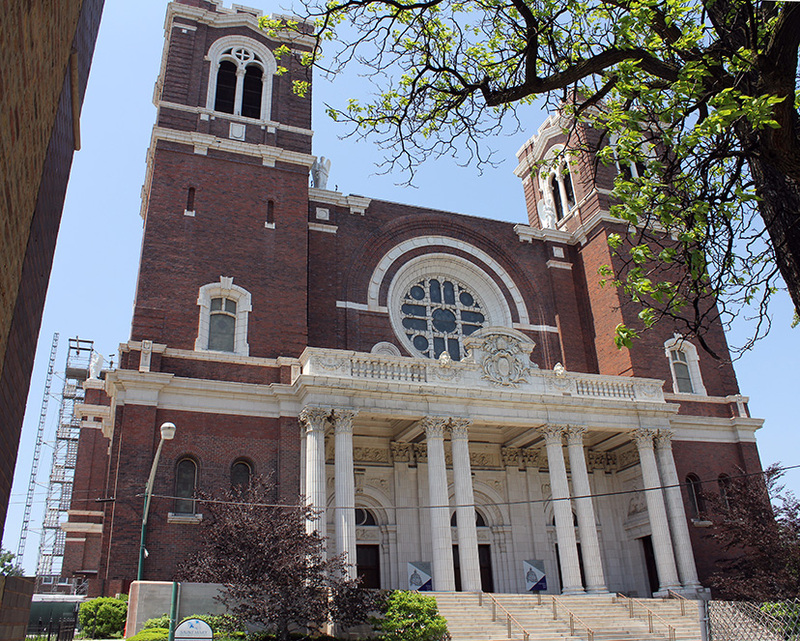 Parishioners, Preservationists hold Vigil to Save St. James Church as Developer offers to do Rehab for the $5 million Archdiocese has earmarked for new church.